The Tree Top One Bedroom, is an elegant, bright 2nd floor unit with tropical modern king bedroom, teak and rattan furnishings, spacious bath with separate shower and tub, spacious living/dining area and well stocked kitchen and offers privacy amid tree top blooms and tropical birdsong. The sunny, lanai offers washer/dryer in the 'laundry closet' and an umbrella table for warm evening dining under the stars or breakfast coffee with the birds. A/C and ceiling fans in both the living area and bedroom. Walking Distance to Wailea Marriott, Grand Wailea, Shops of Wailea and everything along the Wailea Oceanfront Trail. Morning calm invites you to snorkel amidst the colorful coral at the edge of Ulua beach, stroll or jog along the paved shoreline path or just plant yourself in whichever of Wailea's five beaches that suits your fancy. Don't forget to keep your eyes open. During the winter season this is one of Hawaii's best walks for observing humpback whales. In the evening, sundown again draws you here for a romantic stroll, or perhaps a beachside cocktail. Just a short distance from the beaches, hidden in a tropical oasis, are the Grand Champion Villas, a quiet community of well appointed apartments offering spacious, appealing accommodations. Our affordable 'Tree Top' offers a light-filled, sizeable,(approx. 790 sq ft.) one bedroom, one bath apartment with fully equipped kitchen, living/dining room and large Garden View lanai. Nearby are two pools secreted amidst Grand Champions' verdant foliage, where gas BBQ's and umbrella topped tables are available. If all of this is not enough, Wailea offers spectacular, award winning golf courses, a superb tennis facility and a multitude of fine dining options. The Shops of Wailea, offering international shops and local retailers is practically at your doorstep. In the adjacent town of Kihei, you will find everything you need; grocery stores, Hawaiian market places, and restaurants for all tastes and budgets. The Piilani Highway will easily lead you from Wailea to all of Maui's spectacular attractions. Or, you can follow the Wailea Alanui road just a few miles east, where it narrows and offers access to a variety of beaches backed only by shady Kiawe trees, a 2000 acre natural preserve of beautiful bays and Maui's most recent lava flow. 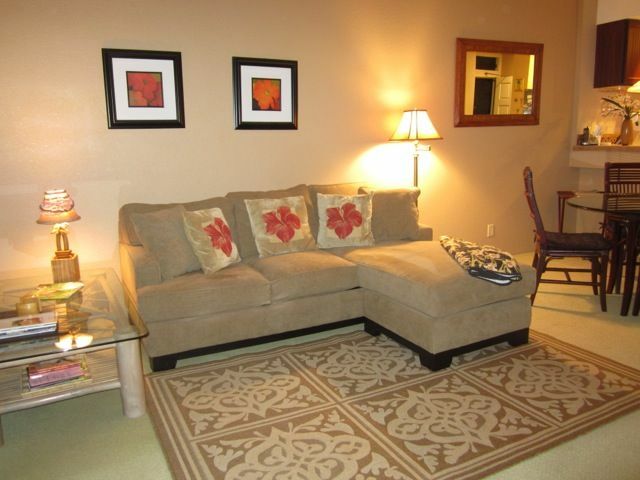 Come experience Wailea and Maui at our affordable ' Tree Top' one bedroom. NOW WITH HIGH SPEED WIRELESS. arriving/departing same day...and if cleaning schedule allows. The condo was centrally located, only about 10 minutes walk from premier shopping, restaurants, and the beach. The owner was very responsive with questions and helpful with early check-in and late checkout. The condo has everything you need! Beach chairs, umbrellas, even a cooler. The bed was very comfortable and there were extra pillows in the closet. The kitchen has everything that you need. I would have given 5 stars, but I think there were a few small things that could improve. 1) There was black mold in the shower on the silicone around the door and even on the squeegee that was to be used on the glass. This can probably be remedied with some mold and mildew cleaner and a bigger bathroom exhaust fan. 2) The towel situation was not ideal, there were strict instructions not to use bleach. I don't know about you, but I prefer shared towels bleached clean. I would suggest the ower purchase some hotel quality towels that can be bleached and have more than 4 washcloths available. I had to wash towels several times during our six-night stay. Thankfully there were laundry pods provided! Other than those two small issues, we had a wonderful stay and would definitely stay in the Treetop Luxury Condo again! What a great place to have 2 weeks of peace and quite. Condo was very nice. Owner allowed us to check out later then 11 am. Thank you Anne for sharing your condo with us. Grand Champions is a reasonable walking distance to beach, tennis and restaurants. The condo is comfortable and well supplied. This was our third trip to Maui, and our second stay at this condo. We love it! The location in Wailea is close to everything...the beaches, shops, restaurants. Anne also had all new beach gear...umbrellas, chairs, snorkel gear, and a cooler. This made it easy to head to the beach as soon as we were ready! This trip, we also took advantage of the community pools and BBQ grill...both are well kept, great amenities at this complex. Also, since we were here over a week, the full washer and dryer on the lanai made it easy to do laundry too. My husband and I have stayed at Grand Champions four times. We love the location and the property. Nice Pools, nice BBQ, and grounds are well maintained. The unit is on the second floor overlooking a beautiful treetop garden with plumeria and bouganvilla. It is quiet and the lanai is a lovely place in the morning to have breakfast. The kitchen is well stocked with all you need. There are new beach chairs and umbrella.The washer and dryer are a plus. The bathroom is a bit dated, and the unit is showing some wear. The bathroom towels are worn and stained, and the beach towels had some holes. With a little updating, paint, and new towels, this would get 5 stars. It is a great deal for the price. The property manager was available for questions. Thank you for your review and letting me know about the towels. We will review all the towels and replace them. Also the property manager can be called to change any items during your stay. Third time here this year. Can't beat the convenient, yet quiet location. Love the private view of the trees and birds off the lanai. The place is always clean and well-equipped. Having its own washer and dryer only adds to the convenience. Walk/jog trail - The Wailea Oceanfront trail, nearby, meanders along one of the most beautiful, scenic coastlines in Maui.